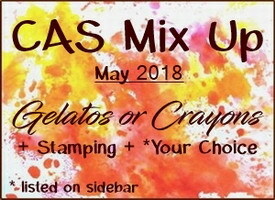 It's the first of May and the CAS Mix Up Card Challenge is up at the blog! And it's a fun one! Bonnie is our creative host this month and she is asking us to use Gelatos or Crayons. 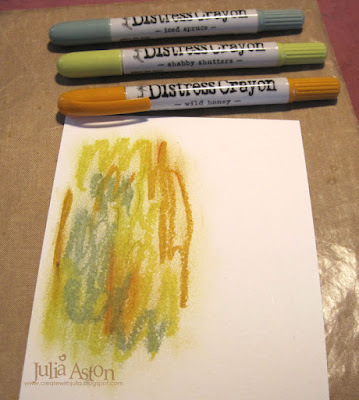 Now I have had Ranger Distress Crayons for a couple of years now and have not used them much - so I was happy to see the videos with ideas on using these crayons posted over at the challenge. I took a few photos of my creative process. 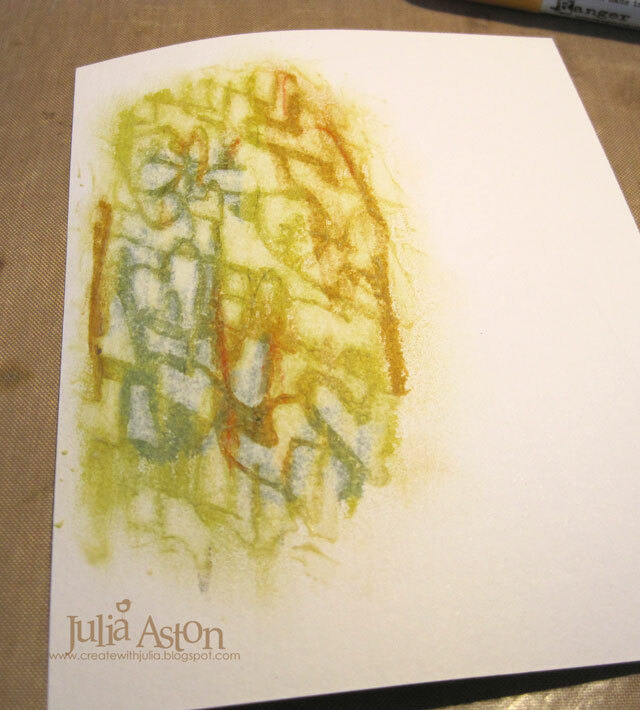 First I rubbed 3 different colors onto watercolor card and rubbed them to blend with my finger. I used Iced Spruce, Shabby Shutters and Wild Honey. Then I laid the Heart Struck Stencil from Tim Holtz/Stampers Anonymous over the colors and rubbed over the stencil with a baby wipe to remove the color. And when I removed the stencil - this great design was revealed! I added this sweet fox washi tape by Alexandra Renke across the middle of the crayon design and stamped a sentiment from Butterfly Blooms from PTI using Cocoa Bean Ink. 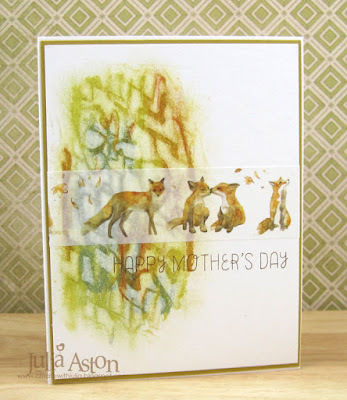 I'm so happy to know this lovely technique using the Distress Crayons and Stencils - I'll be making more cards using it for sure! So please join us in this fun challenge. There are several technique videos to inspire you! Check out all of the wonderful inspiration from the Design Team here at the CAS Mix Up Blog! You have until 5/24 to link up your card! 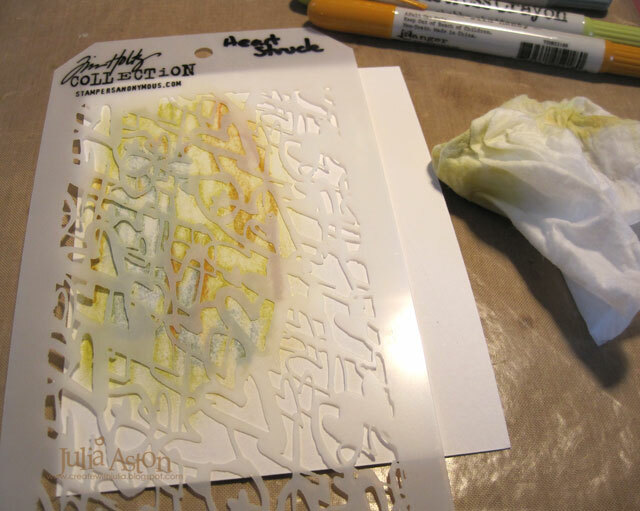 Paper: Canson Watercolor Paper, Soft Saffron and white - PTI. Accessories: Ranger Distress Crayons Iced Spruce, Shabby Shutters, Wild Honey, Heart Struck Stencil - Tim Holtz/Stampers Anonymous, Fox Washi Tape - Alexandra Renke, baby wipe. Awesome background, Julia! Love these colors together and the pattern from the stencil! The Washi tape with the foxes is adorable! A fun card and great use of the Distress Crayons! Love the technique with the stencil and the crayons - I must try it! And I adore the sweet foxes on the tape. A fabulous card! Oh, how pretty! Interesting how it comes out with the stencil. I really need to watch more videos. The colors are perfect with your sweet foxes. Such a fun and artsy crayons background for your sweet washi tape foxs. I agree..an awesome challenge to inspire us to use our gelatos and/or crayons properly. TFS Julia. Hugs.. I clicked on Renke on your page and ended up here!! LOVE the fox washi tape. I love A. Renke dies and thought that was what I was going to see...but it was washi tape.. I will have to find some. So fun! !